Join writer, Valley Haggard and artist, Linda Laino for a magical and luxurious week long retreat of painting mandalas and writing our stories in beautiful San Miguel de Allende, México. Beginnings, endings, cycles and circles create the patterns of our lives. What do writing and mandala painting have in common? They can both uncover layers to the self. They can both help access the source from where we acquire our energy, self-worth, creativity and spontaneity. This retreat is designed to accommodate beginning painters and writers as well as those that make it their life’s work. (see more specifics from Valley and Linda below). In honoring the creative and spontaneous spirit, this 7-day retreat will have beautifully balanced days of painting and writing, along with time for exploration, observation and meditation. Below is more information on what each day will be like and our daily schedule. San Miguel de Allende, Mexico is a World Heritage UNESCO puebla magia, not to mention voted one of the best places in the world to live by Conde Nast Traveler 2 years in a row. Click here for a little more information and links of things to do in San Miguel. Linda has lived in San Miguel for over 6 years and has been able to use her contacts there to insure participants take home some wonderful local flavor along with their written and painted explorations. We are sure you will be delighted with the accommodations and facilities! Casa de la Noche is a former bordello steeped in the history and energy from artists and musicians who passed through there in the 40’s and 50’s. Today, owner Barbara Poole has been running the boutique hotel as a B&B and top notch event space for 16 years. Being an artist herself, the hotel reflects her creative, eclectic sensibility. The spacious and well-appointed rooms and courtyards create a sense of old world discovery but with all the modern conveniences. It’s proximity to centro is a mere few blocks making it a super convenient and easy home base from which to explore San Miguel. All materials will be provided as part of the package, but of course, you should feel free to bring whatever you think will help you create your best experience: favorite journal/sketchbook, media or writing pen. We have designated four price structures according to the type of room you prefer. The prices range from $2100 - $2700. Below are the four room price categories and links to see the options. We strongly suggest that you indulge in a private room however, each room can accommodate 2 people if you would like to share. All of the suites and deluxe rooms have king beds that can be split into two twin beds. A kitchen is available for use by all participants throughout the retreat. Please note: the hotel does not have an elevator. Please let us know if you have concerns about this. All room rates include our delicious Healthy-Start breakfast. Provide your own accommodations but join us for workshops + outings. Retreat facility with studio space available 24 hours. In order to hold your spot, please register by December 1, 2018. Special early bird discount of $100 if deposit paid by November 1. Payment balance is due on or before January 25th. To register, select the room you want and click on the PayPal button to make an $800 deposit. Your total registration fee depends on the accommodation you select. There will be no deposit refunds issued. There is limited refund for the balance before Februrary first, with conditions. Please email Linda or Valley if there is a need for consideration. If, due to unforeseen circumstances, Valley and Linda must cancel the retreat, 90% of monies paid will be refunded. Retreat price does not include your travel costs to San Miguel. As always, for best flights, we suggest you book far in advance. Reservations on your own must be made to BJX (Leon) or QRO (Queretaro) airports in order to accommodate the free shuttle service ($60 value). If for other reasons, you prefer to fly into Mexico City, please ask Linda for options to get to San Miguel (almost 4 hours). As a precaution, we suggest that you purchase travel insurance. If you have any other specific concerns about travelling to Mexico, please email Linda and she will be happy to help! Breakfast is included with all room costs. Unless specified, you will be responsible for your lunches and dinners in SMA. There are many options and a suggested list will be provided. March 23: Arrival, welcome gathering with heavy hors d’oeuvres and margaritas. March 24: Writing and painting. Lunch and dinner on your own. March 25: Writing at Charco del Ingenio Botanical Gardens in the morning. Painting. Lunch and dinner on your own. March 27: El Escondido Hot Springs in the morning. Lunch at Hot Springs (lunch not included) /free afternoon for individual consults with Valley and Linda OR take afternoon off to explore or do your own thing. Linda and Valley will be available in the studio. March 28: Writing and painting. Lunch on your own. Farewell Mexican buffet at Casa de la Noche with critique and share. March 29: Breakfast, wrap-up, shuttle. Note: The above schedule may change slightly depending on weather, needs of the group, or special events in town. Valley Haggard is the author of The Halfway House for Writers (2015) and Surrender Your Weapons: Writing to Heal (2018). She is the co-editor of Nine Lives: A Life in 10 Minutes Anthology and the founder of the Life in 10 Minutes Project, Podcast and Press, all of which are dedicated to helping people from all walks of life write and tell stories from their lives that are brave and true. Valley has been a Waffle House waitress, a dude ranch cabin girl, a cruise ship stewardess, a book reviewer, and a freelance writer. 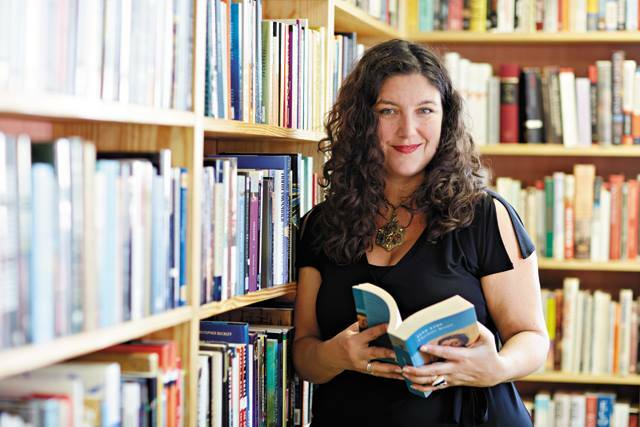 She leads Life in 10 Minutes workshops, living room tours and retreats around Virginia and co-founded a writing center in the heart of Richmond, Virginia. She lives with her hound dog, two cats, one bearded dragon, a husband and a son in the house she grew up in. Visit her at www.lifein10minutes.com to learn more and to submit your own stories, 10 minutes at a time. The word mandala from Sanskrit translates to “circle”. In its simplest definition, mandalas are viewed as sacred paintings that have been used for centuries in Hindu and Tibetan traditions as a focus for meditation. Tibetans believe when we enter the mandala, we are guided through the cosmos to the center of our reality; to our essence. “Centered” is where we all strive to be in our lives. Viewing or making mandalas can help calm our monkey minds. Beyond these traditions, we can understand the lure of circles in our daily life. We are governed by circles and cycles that connect us to nature: the seasons, the phases of the moon, the rise and fall of our breath and the circle of life and death itself all remind us that we are constantly in motion; our bodies, minds and emotions all being connected to the endless flow. We are always beginning and ending and beginning again. The cycles bring a certain order to our lives and whether we are conscious of it or not, we find comfort in their certainties. What is at the Center? So aside from meditation practice, how do we get to the center? Where is the center? And more importantly what “stuff” is even at the center? These are all great questions to ask and ones that this retreat can begin to explore. The answers will be different for each person. By working in these two mediums of writing and painting, you can begin to peel back the layers; some hidden for years, some you may not have been aware of. You will begin to see connections made between your stories and your images. While there may be a “product” that you are happy to leave with, we will focus more on process so as not to block any doors by making something too precious. Art in any form, is at its most powerful when it connects. If we connect to something deep when we are creating it, a viewer or reader will connect to something deep as well. These are the powerful ways that art can impact our lives. Recently here in San Miguel, I spied a mural that said “Without poetry, there can be no community”. This speaks to the heart of the matter. Art is more than pretty pictures. It provides a way for us to dream, be inspired, make sense of the world and make connections within our own community. Writing stories and painting mandalas can help get us there. As we push gently against our comfort zones and learn to trust the words, images and voices that come, we will be able to mine the dreams, memories, mythologies and origin stories that make up our personal narratives. As we embrace our sacred and our profane, our darkness and our light, our brokenness and our pain, we will access the healing and transformation that comes by harnessing the power inherent within our own treasure chest of experience. Each writer will receive gentle, strength-based feedback tailored to their specific needs as well as guidance and prompts from my new hybrid memoir/writing guide, Surrender Your Weapons: Writing to Heal. With an emphasis on process rather than product, each writer will emerge with the thread that binds their stories together, a fresh and vital portfolio of first drafts, vignettes, new ideas and techniques for creating, and honoring the stories of our lives. We can’t wait for you to join us in Mexico.